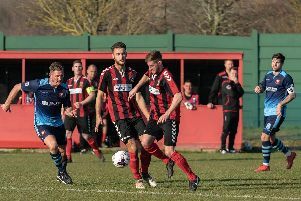 Horndean were unable to cause a Wessex League premier division upset as they fell to a 2-0 defeat at leaders Andover Town. George Hallahan netted a first-half double as the Deans returned to Five Heads Park empty-handed. Michael Birmingham’s side got off to a poor start and found themselves behind after just seven minutes. Mike Gosney picked out Hallahan inside the box and the Andover striker headed home past visiting goalkeeper Luke Thomas. The Deans stopper produced a fine save to thwart Reece Rusher’s half-volley on 27 minutes. But the league leaders increased their advantage two minutes before half-time. Hallahan grabbed his second of the game when he latched onto Ben Cook’s flick and slotted home. Horndean responded well in the second half and in the 52nd minute Miles Everett flashed a shot just off target. Harry Jackson replaced Josh Maloney and the substitute tried his luck on 64 minutes but his shot was swallowed up by Andover keeper Luke Cairney. Birmingham’s troops continued to put pressure on the hosts and Evertett forced a fine stop out of Cairney on 86 minutes. And the Deans forward again went close one minute before full-time but his shot was off target. Horndean missed out on the chance to leapfrog AFC Portchester in the Wessex League premier division table. The Royals were left frustrated as their game against Bemerton Heath Harlequins was called off a few hours before kick-off. Although both teams were prepared go ahead with the fixture, the match officials deemed the Blanchard Wells Stadium pitch unfit to play on. Mick Catlin felt it was an unfortunate situation. The Portchester joint-manager said: ‘To be fair the pitch was borderline. ‘We had people working on the pitch all afternoon. ‘It had been rolled and it looked fine at 6pm. ‘When the officials saw it starting to cut up during the warm-up they decided to call it off. ‘The referee felt it wasn’t safe and the players could’ve potentially turned their ankles. ‘It was a shame because both teams were prepared to give it a go. We had spectators coming through the gate and out was a wasted journey for Bemerton.